These education quotes will give you all the reasons to realize the importance of education, learning and teachers in your life. Education has become an integral part of human life – something as important as food, shelter and clothes. Education helps you evolve. It helps you think rationally and improves your position in life and society. An educated person is capable of leading a healthier lifestyle, makes his own decisions independently, follows ethical values, contributes to the society’s growth, and makes his community a safer and better place. Philosophers, leaders and men of science have always emphasized the importance of education in the society. Education removes all limitations and opens your mind to new possibilities and a better world. It is education that carves out a sculpture out of a stone. Upon the subject of education … I can only say that I view it as the most important subject which we as a people may be engaged in. When you make the finding yourself–even if you are the last person on Earth to see the light–you will never forget it. Cauliflower is just a cabbage with a college education. but difficult to drive: easy to govern, but impossible to enslave. Education is not something which the teacher does …it is a natural process which develops spontaneously in the human being. It is in fact a part of the function of education to help us escape, not from our own time — for we are bound by that — but from the intellectual and emotional limitations of our time. Where are gone those older spirits in education who knew and taught boldly that school is an apprenticeship, and a hard one, for a life harder yet? and that prayer is necessary not to escape burdens but for strength the better to carry them? A man is never too old to learn. If you are planning for a year, sow rice; if you are planning for a decade, plant trees – if you are planning for a lifetime, educate people. The more you use your mind, the more you’ll have to use. It takes ten years to grow trees but a hundred years to rear people. I find television very educational. The minute somebody turns it on, I go to the library and read a good book. My grandmother wanted me to have an education. That’s why she kept me out of school. It doesn’t make much difference what you study, as long as you don’t like it. History of humanity is a race between education and catastrophe. Education is learning what you didn’t know even know you didn’t know. Any fool can criticize, condemn, and complain — and most fools do. The best teachers are those that show you where to look but don’t tell you what to see. Inspirational sayings for teachers to be posted in classrooms, in newsletters and more. 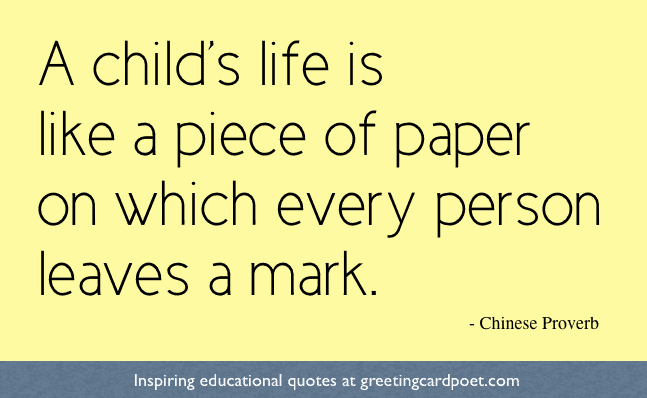 Bring these education quotes to life by putting them to use.